This week the new game Glow was launched by Netentertainment. 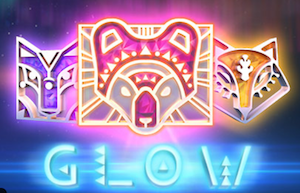 Glow is an amazing slot with wild features and a great design. Some of you might have seen Glow before since the slot use to be exclusive for casinos included in the BML Group. So Players at Betsafe or Betsson have been able to play on Glow but now is the first time that you can play the game at any casino that offers Netent slots. This is just one of the launches from Netent this month. Next week the new game Guns n Roses will be release at most netent casinos and this is really something we are looking forward too. But before that you can try Glow with some exclusive free spins at the popular online casino ComeOn. If you have signed up at ComeOn through our site previously you are now entitled 10 exclusive free spins on Glow. These spins have already been credited to your account. So all you have to do in order to use them is to login to your account at ComeOn and open up Glow. No deposit is needed so this is your chance to try Glow without risking any of your own money. The free spins are also free from wagering requirements so anything you win is totally yours! This is an exclusive offer that is time sensitive so you must use your no deposit free rounds before the 24th of January. This exclusive offer is also valid for new players that signs up through the bonus links on Freebonus.se. As a new player you will also get additional free rounds and you can read more about this welcome offer below. Claim your exclusive offer at ComeOn! When you sign up at ComeOn through us you will not only get 10 exclusive free spins on the new slot Glow. You will also get 10 free rounds that can be used on Starburst. And as this wasn't enough you get 20 extra welcome spins that are valid for you on ceveral different titles from Netentertainment. These titles are South Park, South Park Reel Chaos, Lights, Starburst, Twin Spin and Jack Hammer. You get all these welcome spins with no deposit required! But remember that the offer is exclusive for our visitors. When you make your first deposit to ComeOn you will also get a generous welcome bonus. And as you might know you get rewarded with loyalty points when you play at ComeOn. These loyalty points can be traded into free spins, cash our tickets in the casino's own shop.